Seabury Hall Creative Arts Center, a theatre prep-school performing arts center on Maui in Hawaii, will receive USITT's highest architecture award--the Honor Award. Three other venues – the SF Jazz Center and the Bing Concert Hall, both in California, and the Jerome Robbins Theater in New York --will receive Merit Awards for 2014. USITT's Architecture Commission will present the awards in a special session on Friday, March 28 at the 2014 Annual Conference & Stage Expo in Fort Worth, Texas. The Architecture Awards presentation is one of 18 sessions planned by the Commission, including several offering AIA/CES credits. The Architecture Commission annually recognizes the best contemporary performance spaces built or renovated in recent years with Honor or Merit awards. 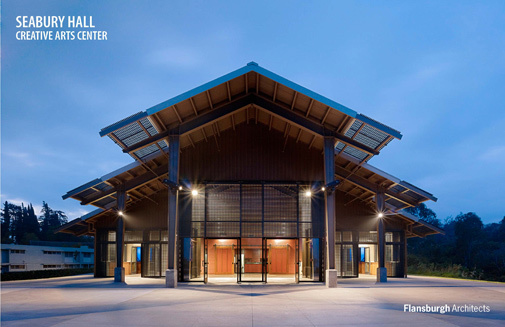 The top winner for 2014, Seabury Hall Creative Arts Center in Makawao, was designed by Flansburgh Architects of Boston, Massachusetts, with associate architect Riecke Sunnland Kono Architects Ltd. of Kahului, Hawaii, and theatre consulting by Theatre Projects Consultants of South Norwalk, Connecticut. The $5.4 million arts center replaced an outdated facility with a new 500-seat theatre and dance rehearsal hall on the grounds of Seabury Hall, a college preparatory school for performing arts students set on the high slopes of the Haleakala volcano on East Maui. With the barn door open, the dance studio beyond can be seen from the theatre. The architects used a steel shed structure for the theatre, with wide barn doors that open the space to the natural environment overlooking the Pacific Ocean. The pre-fabricated construction of the theatre and dance rehearsal pavilion kept the cost under $5.5 million. The project was completed in September 2012. Two of the Merit winners are California projects completed in 2013 – the SF Jazz Center in San Francisco, and the Bing Concert Hall at Stanford University. The third is the renovation of a former rental roadhouse at the Baryshnikov Arts Center in New York into the Jerome Robbins Theater. 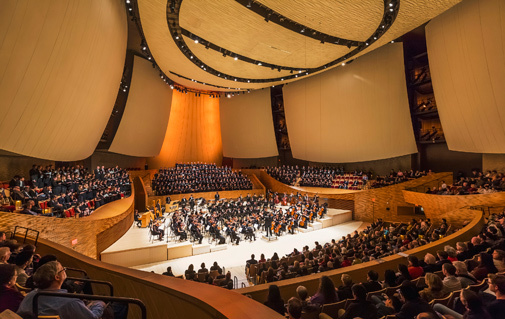 The $75 million Bing Concert Hall was designed by Ennead Architects of New York with theatre consulting by Fisher Dachs and acoustical consulting by Nagata Acoustics. It was constructed at a cost of $75 million as both a new, state-of-the-art home to the university's music department and Stanford Live, and a venue for visiting performers serving the greater San Francisco Bay Area community. The SF Jazz Center was designed by Mark Cavagnero Associates of San Francisco with consulting by Auerbach Pollock Friedlander and SIA Acoustics, at a cost of $32 million. It is the first freestanding venue in the United States designed especially for jazz. 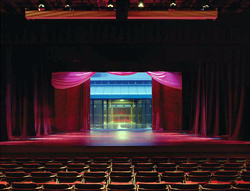 The three-story center is comprised of the Robert N. Miner Auditorium, which accommodates 350 to 800 seats, plus a lab, rehearsal space, box office, café, and offices. 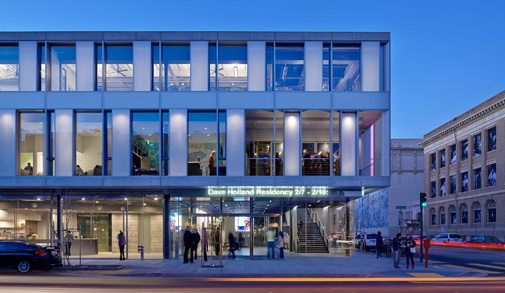 The Jerome Robbins Theater at the Baryshnikov was formerly known as Theatre C, and is now a 299-seat, end-stage theatre and main performance space completed in 2010. The architect was Wasa/Studio A, with Arup/David Taylor as theatre and acoustical consultant. USITT's Architecture Awards are chosen based on creativity, contextual resonance, functional operation, use of new technology, and community contribution. Each project will be represented in a special exhibit at Stage Expo, where an awards reception will be held. The adjudicators for the 2014 awards included architect Buzz Yudell of Moore Ruble Yudell Architects, theatre consultant Robert Long of Theatre Consultants Collaborative, and Rick Talaske of Talaske Associates. Architecture Commission Vice-Chair William Murray oversaw the adjudication process.